Michael angry with Steph getting 70% of Charlie's will. The police raiding the Hoyland house. Steph saying the judge will think she'll have motive because of the will. Sindi finds Stu chopping up tomatoes in the kitchen and is worried about him slicing a finger off. Stu laughs and says if Ray Charles can use two hands to play a piano he's sure he can manage a few vegies. 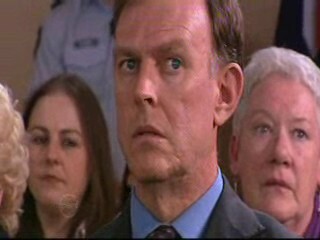 “I'm ready to take on the world which is just as well… Toadie's on his way over.” Sindi looks worried at this prospect. Max asks Summer to set the table while Steph chops vegies (just like Stu! They're soulmates! ), and Boyd is at the stove. Summer complains that she can't find anything and Boyd looks worried – he obviously didn't tell anyone about the police raid. Max also wonders where his laptop is and Boyd lies and says it's in his room, he'll return it later. Toadie rocks over for a last minute conference with Steph. He says she should stay calm, focused and try not to panic. Toadie also wants to know what she's wearing so he can coordinate (red and green should never be seen you know). No, he's really just worried about her turning up in jeans and a t-shirt – that's a no-no with this judge; he likes women to dress like women. Steph looks alarmed. “Oh, you don't mean like pearls and twin-sets though do you?” Thankfully she won't have to look like she's out of the 1950's, but a crucifix necklace wouldn't go astray according to Toad! “Just remember,” he adds. “Think before you talk.” And on that note he says for them to enjoy dinner and cheerfully bids them adieu. Stu and Sindi sit down to eat, pondering what Toadie may want. Stu thinks they may be getting antsy over nothing and Toadie might just want to see how he's doing. Sindi doesn't think so though. “No, he hates us. You especially.” “Thank you,” Stu deadpans. There's a knock at the door and Sindi runs over to let Toadie in. They chit chat about Steph's case before delving right into the reason Toadie swung by. TOADIE: I took the liberty of going to the bank and they're fine to extend my mortgage. TOADIE: To buy you out. It's pretty obvious that you're not going to be moving back. I need to get on with my life and you guys need to do the same. So this seems to be the cleanest solution for all parties concerned, yes? Carmella jumps on the couch next to Connor and giggles excitedly about how great it is they're living together, and how everything's so gosh darn wonderful with rainbows, puppies and fairy floss galore. Connor is the antonym of thrilled though. He's happy living with her (and the million stuffed toys) but Toadie wanted him to have a word with her. “He wants you to try to sort of keep the place a bit tidier…” “Right,” she eye rolls. “And this is by order of the House Of Trouser?” Apparently he doesn't like all her make-up and (the million) stuffed toys she leaves everywhere. Carmella's not impressed. Stu and Sindi are still trying to grapple with the concept of Toadie buying him out. He asks what would happen if he doesn't think it's a seller's market out there at the moment, but Toadie rebuts that it could be a buyer's market. He gets Stu to admit that he won't be living in Number 28 forever but that he also may be considering buying another place with Sindi, “So what else are you going to use as a deposit then?” Stu can't see what the rush is though and wants to know the real reason Toadie is being so hasty. TOADIE: Right. I want you out of the house because I want you out of my life. Toadie walks out the door as the tinkly piano music of despair plays in the background. Stu sinks into his seat, his poor little flavour saver quivering in sadness. David saunters over to Lil, all happy because his box of badges have been printed and are ready to pass out to the public. He tells her that he's got a meeting that night because he's on the campaign trail and that he'll see her later on at the wrestling. Lil's all, hold up there buddy, wrestling? And David's all, “It's a chance to press the flesh!” He laughs and adds that she's got to be there to help him out, “you're my first lady!” David skips out to his car. Lil notices that he forgot his mobile on the table but she's too late to give it to him. She also notices a tiny mistake on his campaign badge. David Bishop. A change for the bitter. And unless he spoke in a New Zealand accent when he ordered the badges, he's got it very, very wrong. Lil freaks and runs out to see if she can catch up with him. Carmella is still quietly sulking on the couch. Connor tries to make her feel bitter better by telling her it's only for a couple of weeks, then she can do what she wants. She doesn't see why she has to impress Toadie though; especially since he seems to be the one who leaves empty pizza boxes and beer cans around the house (the empty can, incidentally, is Toadie's pride and joy from the 2002 Grand Final when the mighty Bombers reigned supreme). Connor reasons with her that their stuff is in constant rotation whereas Carmella's things are stationary. She gets angry and says he's on Toadie's side. Connor tries to protest but he doth protest too much and a sneaky plan forms in Carmella's mind. CARMELLA: So you really want tidy do you? Connor's not looking so sure anymore. There is a huge ring set up in the middle of the hall and two bulky wrestlers are flinging themselves about in it while Max commentates. Sindi and Stu walk in. SINDI: Oh my God, I can't look! STU: Well that makes two of us. Max has grown tired of yelling and takes a break, striding past the two of them. 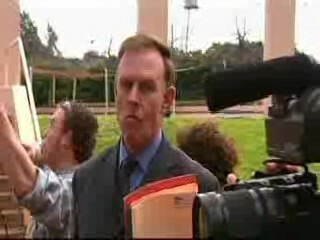 STU: How's it looking, mate? MAX: How's it look like it's… okay. Lou and his big ideas. MAX: I don't know, have you seen… ah, he's probably found some hubcap highway. Max isn't impressed that he has to be there when he should be at home with Steph. David swings by to stick some badges on people. Stu wonders what on earth he has just had put on his shirt. Connor walks (with a towel wrapped around his freshly washed hair) into some alternate universe Number 30 living room where everything is clean and tidy and doesn't resemble a footy locker room slash pizza hut. Carmella has been on a cleaning spree and also makes him take out the empty pizza boxes and beer cans that cluttered up the place as well. Connor says he didn't mean for her to go all weird about it but she doesn't listen and sets him on his way with the recycling. “Just trying to do my bit!” she smirks. Max is commentating on the wrestling with as much enthusiasm one would have on a trip to the dentist. “Isn't it amazing?” he practically yawns. Sindi is trying to describe what's happening in the ring to Stu. SINDI: Now the bald guy's giving the other guy a kind of cuddle! STU: Is this Playschool or something? SINDI: Well that's what they're doing. Okay, now the other guy's sitting the bald guy on his knee. STU: So who's wrestling next? Big Ted and Humpty? Lil speeds in to tell David about the mix-up with the badges. He's mortified and tells Lil they'll have to get them all back by retracing his steps. Connor and Carmella come to join the fun and Connor boos Max's lack of energy with the commentating. He solves that by handing Connor the microphone and tells him that he's back on the staff (all while David is hijacking badges – Stu's wondering who's just taken something off his shirt now… he's scared). Connor jumps into the ring and starts his job with relish (there wasn't enough mustard left) just as Toadie walks in excitedly. Sindi? Doesn't share the excitement. She tells Stu about his presence. Stu wanders over in Toadie's general direction as Toad says to Connor that he came to let off a bit of steam before the trial. Toad's very revved up about watching the wrestlers jump about and yells out comments like he knows what he's talking about. The wrestlers kind of play leapfrog and that kind of turns into Frogger as Mr. Beefcake Man tries to squash Mr. No Shirt (definitions taken from The Sindi Watts Book Of Wrestling Moves). Carmella wonders why men find wrestling so thrilling and Sindi agrees, wondering why it all has to be so violent. Toadie can't believe them, wrestlers are modern day gladiators, dang nabbit! Connor calls David into the ring for a bit of publicity. David didn't expect to get hauled up in the air on to the shoulders of Beefcake Man though. He spins round and round like a washing machine while Lil screams to Beefcake Man to put her husband down. Toadie tells Stu what's going on and they wonder if they're going to see the slam. It's all very exciting! I think David might throw up! All the Hoyland/Scully/Cassidy/Sheergold clan that are meant to be there are waiting for Toadie. Steph's also found a skirt to wear much to Toadie's relief. He tells them to just keep walking and not say anything when they have to walk through the throng of reporters and camera people. The media are a bossy bunch though and get up in everyone's faces. They also focus their attention on Michael who has appeared beside them. He wants to talk and says that he's been robbed of the last days of his father's life so he expects justice to be served. Max gets angry and yells out that it's Michael's own guilt that's tearing him apart. The prosecuting lawyer has Lyn on the stand and she looks petrified. He asks her question upon question about Charlie; if he said anything about wanting to die earlier than he should have, if she knew Steph had given him extra pills an hour before she should have, and so on. Lyn answers as truthfully as she can but some of her answers incriminate Steph when they weren't supposed to, not to mention Lyn looks suspicious because she's so hesitant about answering things. Steph is now on the stand with the horrible lawyer questioning her. He's focusing on what Steph was doing with the pillow more than anything. Steph tries to explain that she was just trying to make her granddad more comfortable but the lawyer plays on the fact that she was trying to make a deceased person more restful and how ridiculous that sounds. Some time has passed and the jury come back from making their decision. The judge calls for their verdict and for the defendant to stand. JUROR: We find the defendant guilty. Everyone is in shock and Max rushes over to Steph to comfort her. Poor Steph looks like she's going to crumble into a heap.